On almost every one of the 30 evenings when Sharon and I were in Florida during January we went to the Gulf shore of Pine Island to watch the sun set over Pine Island Sound and the barrier islands Cayo Costa, North Captiva, and Captiva. On most nights we met our new friends Tom and Connie there. 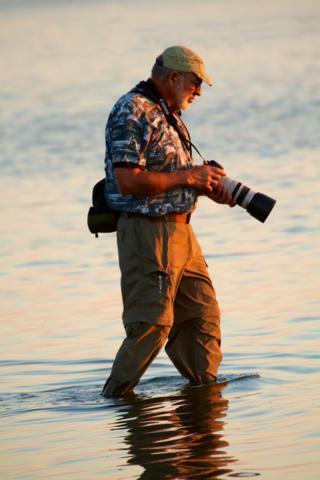 Tom and I usually use the same photographic equipment, a Canon 7D camera and a Canon 100-400mm lens. But sometimes he is even more determined that I am to get the shot. On the morning of our last full day in Florida, I had the pleasure of visiting a paradise for nature photographers, the Venice Area Audubon Rookery. This rookery on a small pond is close to where a dozen photographers, most with bigger lenses than mine, lined up before sunrise to capture images of Great Blue Herons, Great Egrets, and other birds on their nests. Near the small city of South Venice, Florida, the rookery is an hour and one-quarter north of where Sharon and I stayed on Pine Island during the month of January. 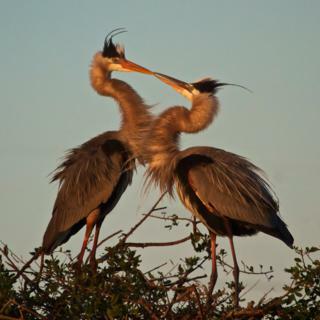 I don’t think that any image ever pleased me more than this shot of the courtship of two Great Blue Herons. The light couldn’t have been better: the sun was at my back, no clouds darkened the view, and the birds were courting. I got this shot about a quarter hour after the sun rose. Sharon and I liked Corkscrew Swamp Sanctuary so much that we explored it three times during our January visit to Southwest Florida even though it was the farthest place we went to from the condo that we rented on Pine Island. This Audubon Society site includes the largest remaining stand of bald cypress in North America, and the birds love it. Consequently, we did too. Walking through a swamp can be tricky. You need high rubber boots and have to watch out for quicksand, mud, and deep holes, to say nothing of deadly water moccasins and alligators. Sharon and I each considered buying rubber boots, but we independently decided not to. Instead we stayed on boardwalks whenever we went to swamps. Walking through Corkscrew Swamp was a pleasure on its 2 1/4 mile boardwalk. We also visited two other parts of this watershed, the Corkscrew Marsh and the Bird Rookery Swamp. But the Corkscrew Swamp takes the cake. I knew that two special birds lived in the swamp, but I didn’t really hope to see either of them. In fact, I saw both of them. 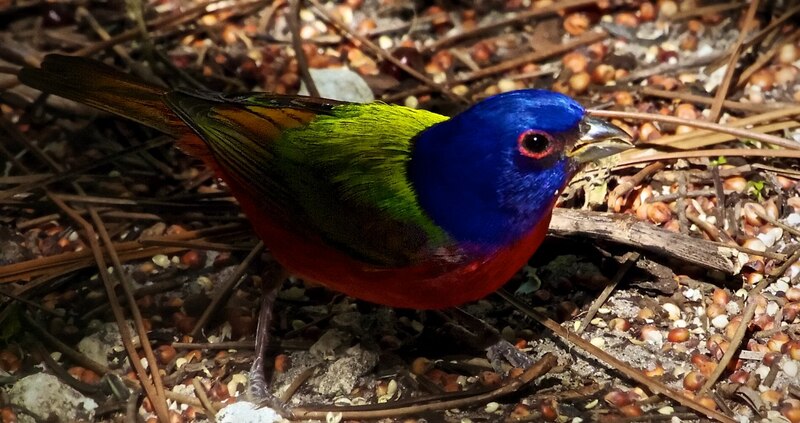 Early on our first visit I got my best shot of a bird that is so unbelievably colorful that we call it “painted.” This is a male Painted Bunting. Only about one mile of Pine Island sound separates the J.N. “Ding” Darling National Wildlife Refuge on Sanibel Island from Pine Island, where Sharon and I rented a condo for the month of January. But since we don’t have a boat or wings, we had to drive across four bridges on a 37 mile trip that took more than an hour to reach this prime birding location. Ding Darling was a national syndicated editorial cartoonist who was an early pioneer for wildlife conservation, working this theme into his cartoons. 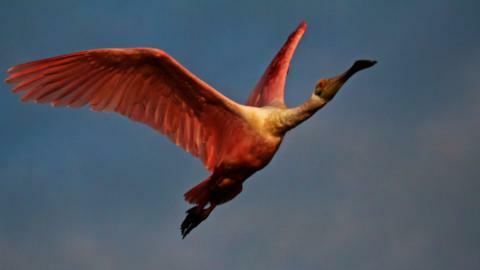 He was instrumental in blocking the sale of what became the refuge and at his urging President Harry S. Truman in 1945 created the Sanibel National Wildlife Refuge, later renamed in Ding Darling’s honor. 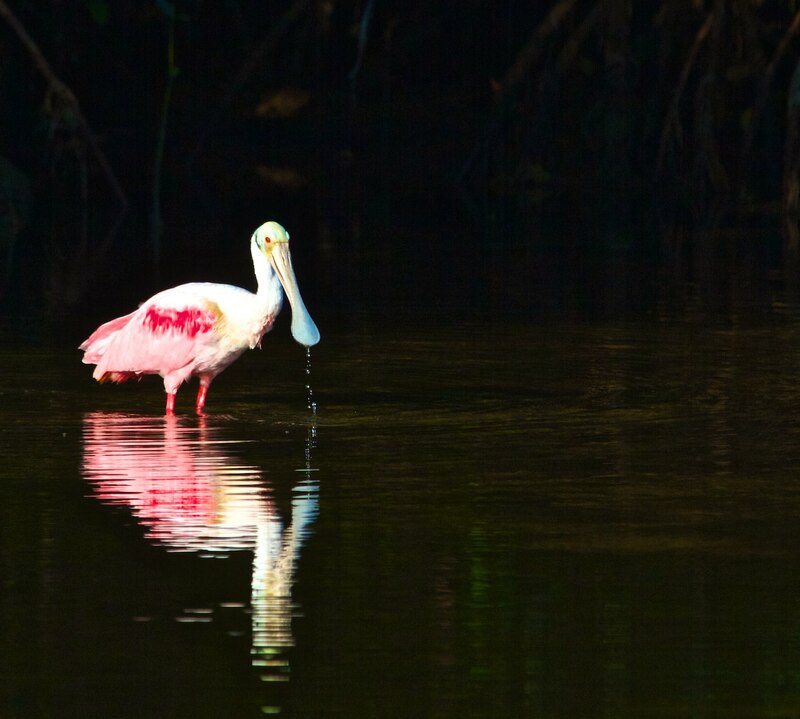 In birding circles the Ding Darling Refuge is the most renowned place in Southwest Florida. It deserves this reputation, particularly for the Roseate Spoonbills that feed there. I saw them. For many years, people could get to Lovers Key only by boat. In consequence only lovers supposedly traveled to the island to enjoy its remote and solitary beach. Today, it is connected by bridges to Fort Myers, which is less than 25 miles north. Lovers Key is now one of four barrier islands that make up Lovers Key State Park. My friend Sharon and I hiked three of the four islands. The park’s main entrance doesn’t open until 8 a.m. so we started at the unlocked north entrance and walked down the Lovers Key beach. 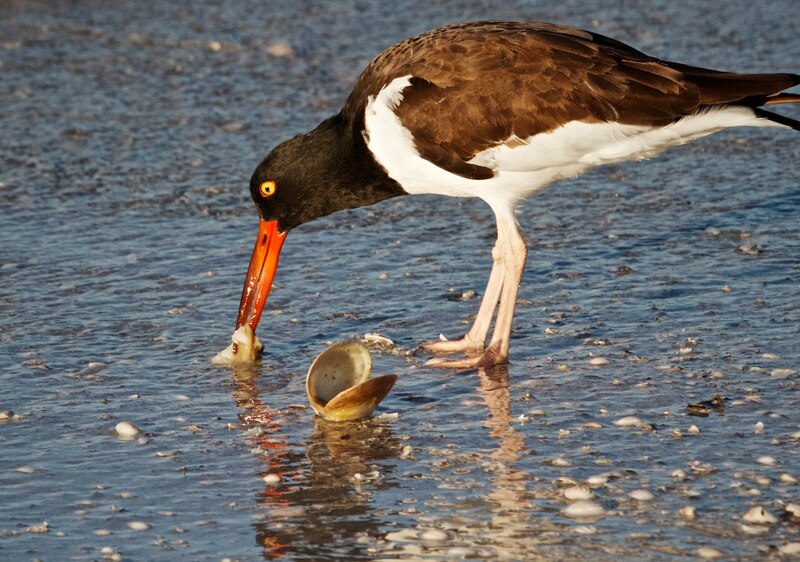 There we found an oystercatcher that had just found its breakfast. After crossing Inner Key we hiked the 2.6 mile Black Island Trail where we were seldom out of sight of the water. Once when Sharon looked down, she saw a manatee just below us and pointed it out to me. I had always wanted to see one of these gentle mammals, but never expected that I would. What a thrill! In addition to Little Estero, the subject of my previous photo essay, the Fort Myers area has considerable bird life on other beaches. While Little Estero is near the south end of Estero Island, Bowditch Point Regional Park is at the north end. This small park has an amazing diversity of habitat, ranging from beach and mudflats to salt marsh and mangrove swamp. With the habitat diversity comes wildlife diversity. We got to the beach at first light, where one of my favorite birds greeted us. 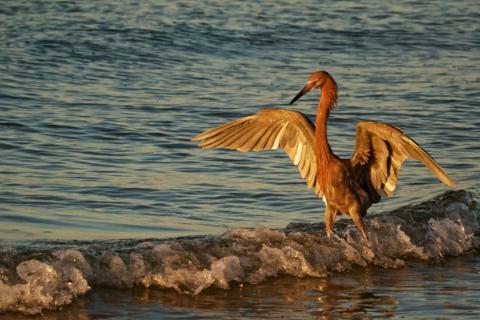 This Reddish Egret was already fishing in the surf. I couldn’t decide which photo I liked better, the one above or the one below. So I asked my Facebook friends which one they prefer. The one above was the overwhelming favorite. But my friends who are professional photographers prefer the one below. So I include them both. Sharon and I loved the laid back feeling of Pine Island in Southwest Florida, but it is almost entirely lacking in sandy beaches. We loved the beaches of nearby Fort Myers as do countless snowbirds and real birds. The best beaches of Fort Myers actually aren’t in that city. They are on Estero Island, the barrier island between Fort Myers and the Gulf of Mexico. Estero Island is part of the town of Fort Myers Beach. Russ Burden, who led my first nature photo tour of birds of Florida in February 2011, told me that the main reason why we drove across the state to the Fort Myers area was to experience birds at the Little Estero Island Critical Wildlife Area. But getting there isn’t easy. No marked trail leads there. The Great Florida Birding Trail directions call for us to park in the beach access parking area at the corner of Estero Boulevard and Flamingo Road. But that’s 0.6 miles even from the north end of this little estuary. Some people park at the north end, specifically at the Holiday Inn at 6890 Estero Boulevard. But even the Holiday Inn is 1.2 miles from the south end, which is a much better place to start, because the sun is at our backs as we start off walking north. So we parked parallel to the south end on Tarpon Road where it intersects with Estero Boulevard and walked the path through a vacant lot to the estuary. We went there twice and each time we got rewarded for our efforts both in the estuary itself and on the adjacent beach. We actually stayed longer on the beach than along the estuary because it was teeming with birds. I especially enjoyed watching the Brown Pelicans, both because of their unusual form and because of the way they fish cooperatively. Fort Myers and Cape Coral comprise one of the largest urban areas in Southwest Florida with a metropolitan area population of about 620,000 people. Located where the wide Caloosahatchee River meets the Gulf of Mexico, this area is one of Florida’s major tourist destinations. Millions of snowbirds winter here together with the real birds that my friend Sharon and I went to see. Our base was on Pine Island at the western edge of the area, about 18 miles from downtown Cape Coral and another couple of miles across one of three long bridges over the Caloosahatchee River to downtown Fort Myers. As we expanded the area that we explored from Pine Island outward we didn’t fail to include these cities. We found great parks teaming with wildlife there. We even found birds on busy street corners. 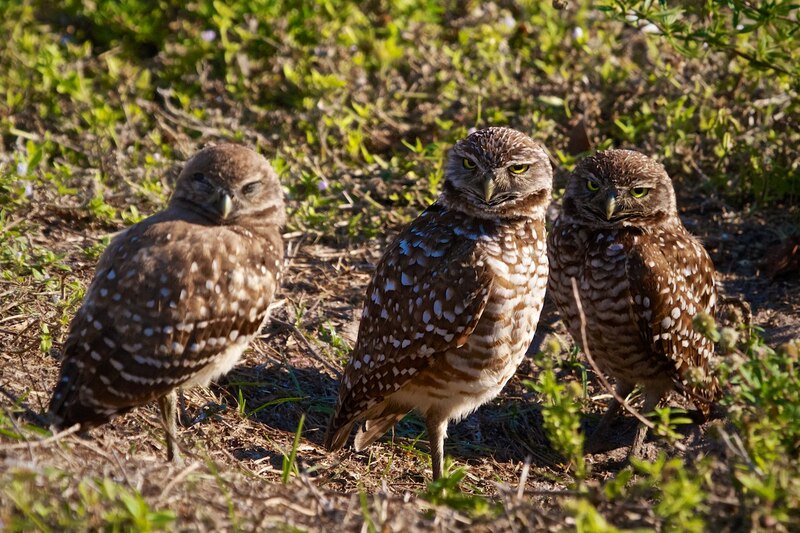 These Burrowing Owls live in an otherwise vacant lot next to Annie’s Cafe at the southeast corner of the intersection of Coronado Parkway and SE 47th Street in Cape Coral. I hadn’t expected to find Burrowing Owls in Florida (much less in a city), because the ones we have in Colorado live in burrows that prairie dogs build. As far as I know, Florida lacks prairie dogs, so the owls there have to dig their own burrows, which is easier there in the soft sand than in the rocky Colorado soil. I love not only the expression of the owlet in the photo below but also the simple background. It’s the pavement of SE 47th Street. Punta Gorda is a small city on Charlotte Harbor 30 miles north of where Sharon and I stayed during our month in Florida. Punta Gorda’s greatest distinction is that it’s where my friend Bob Guetzlaff lives. I got to know Bob when I toured Panama two years ago and have kept in touch with him since then. Early one morning Sharon and I met Bob at the Alligator Creek Preserve of the Charlotte Harbor Environmental Center, where we hiked. 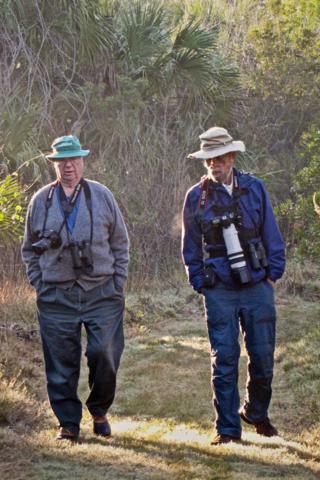 Sharon took this shot of Bob and me when we weren’t looking. Later, Bob took us to some of his favorite places, including Ponce de Leon Park in Punta Gorda. This is where I watched this little bird at work. During our January visit to Southwest Florida for nature, hiking, photography, and birding, Sharon and I relied heavily on the guide to the Great Florida Birding Trail. We explored the 23 sites within about an hour and one-half of our base on Pine Island, some of them multiple times. But we also went to 20 other places were I took photographs that I saved, and I took the most photographs that I saved at one of those other places, the Randell Research Center. We visited this facility of the Florida Museum of Natural History almost every afternoon because its grounds are so beautiful and the wildlife so plentiful. It was also only 6 minutes from the condo that we had rented. 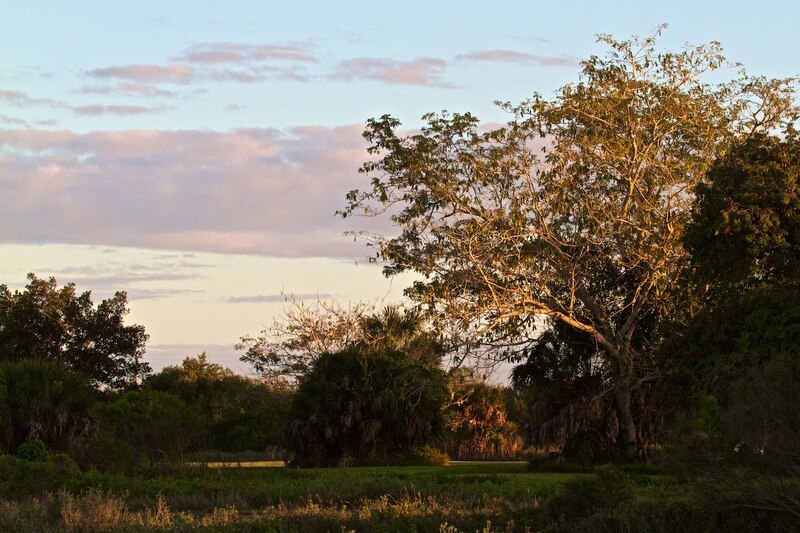 The center is a site of archaeological significance, since it was a Calusa Indian village for more than 1,500 years with enormous shell mounds still overlooking the waters of Pine Island Sound.